Come visit Algoma for your next bird watching adventure. Plan to attend the 5th annual Algoma Bird Celebration (ABC) on Saturday, April 6, 9:00 a.m.—2:00 p.m. at the Algoma Youth Club (620 Lake St). Stay for the day or drop in as your time permits. Information displays and items for sale will be available throughout the day. Children’s book author/illustrator Janet Tlachac-Toonen will be on hand to chat about her wonderful picture books and offer story time readings before and after the live bird program. Free coloring pages designed by the author will be available for children. Programs begin at 10:00 a.m. with Bob Kuhn’s ‘Getting the Picture: Songbirds, Shorebirds, Water Fowl’. At 11:00 meet live owls, hawks and falcons at the family friendly ‘Hunters of the Sky’ program provided by Open Door Bird Sanctuary. Learn how to use native plants in your landscape to attract butterflies at the ‘Butterfly Garden’ program at 12:30 with speaker Karen Newbern of Door County Landscape and Nursery. The United Methodist Men will offer food and refreshments throughout the event. Entries for the Bird City Algoma student photo contest will be on display and prizes will be awarded. 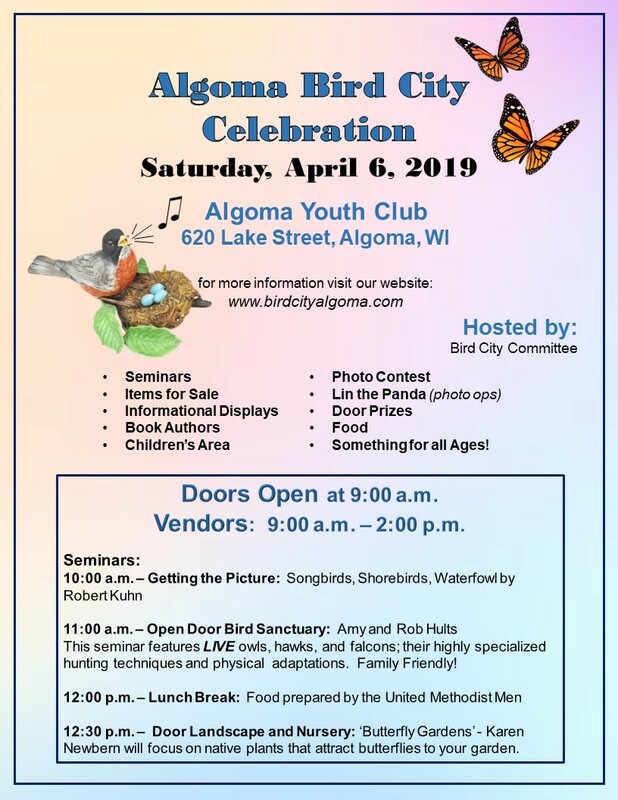 This is a free event planned by the Bird City Algoma Committee to celebrate World Migratory Bird Day. For more information about the Algoma Bird Celebration, birds and birding in and around Algoma, visit the Bird City Algoma website at birdcityalgoma.com and watch for updates on the Bird City Algoma Facebook page. Email questions to birdcityalgoma@yahoo.com. For tips on how you can create or improve bird habitat check out the "Resources" section of the Bird City Wisconsin website. Do you have photos of birds in and around Algoma that you would like to share? Send the photos to amber.shallow@algomacity.org and we will share them here on our website. Please include the name of the photographer, location, date, & time of photo so we can credit your work. Please also identify the species in your photos. This picture of a male hairy woodpecker sitting on a branch outside our kitchen window by Bob Kuhn on January 6, 2018, at 1:27 p.m. This picture of a common redpoll feeding on the ground beneath our bird feeders was taken from our kitchen window on December 25, 2017, at 3:48 p.m. This picture of a pine siskin feeding on one of our bird feeders was taken from our kitchen window by Bob Kuhn on December 22, 2017, at 12:47 p.m. This picture of a female scoter swimming on the Ahnnapee River in Algoma was taken from the Christmas Tree Ship Point parking lot by Bob Kuhn on December 19, 2017, at 3:17 p.m. 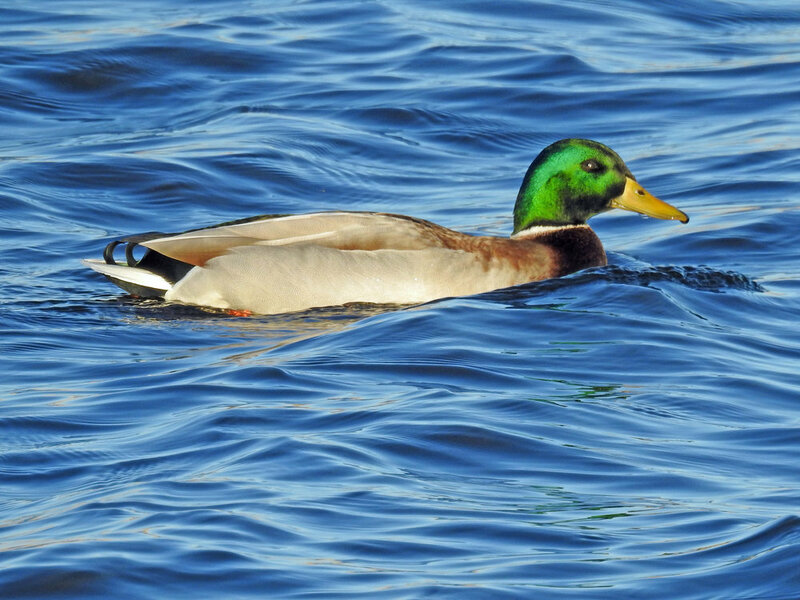 This picture of a male mallard duck swimming on the Ahnnapee River in Algoma was taken from the Christmas Tree Ship Point parking lot by Bob Kuhn on December 19, 2017, at 3:08 p.m. This picture of a male common goldeneye swimming on the Ahnnapee River in Algoma was taken from the Christmas Tree Ship Point parking lot by Bob Kuhn on December 19, 2017, at 3:06 p.m. This picture of a bald eagle sitting in a tree along Lakeview Drive in Algoma was taken by Bob Kuhn on December 10, 2017, at 1:56 p.m. 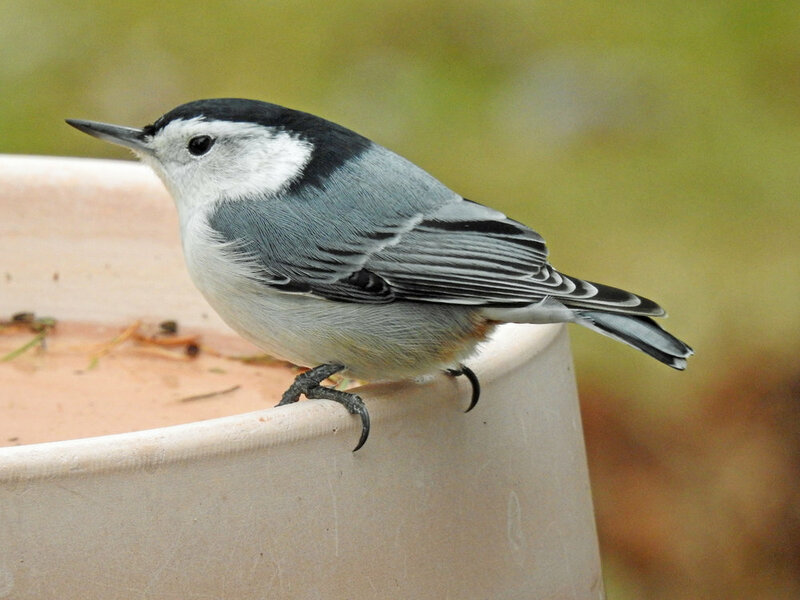 This picture of a white-breasted nuthatch sitting on the heated birdbath outside our kitchen window was taken from our kitchen window by Bob Kuhn on December 6, 2017, at 12:44 p.m. This picture of a long-tailed duck swimming on the Ahnnapee River in Algoma was taken from the Christmas Tree Ship Point parking lot by Bob Kuhn on November 13, 2017, at 9:36 a.m. This picture of a trumpeter swan walking along Algoma's harbor was taken from the Youth Club parking lot by Bob Kuhn on August 3, 2017, at 8:33 a.m. 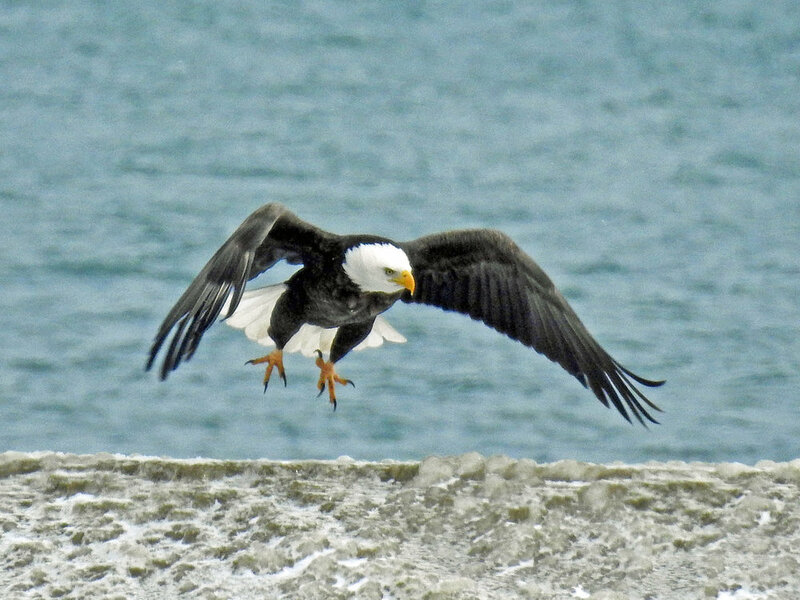 This picture of a bald eagle taking off from the south breakwater was taken from the Christmas Tree Ship Point parking lot on February 1, 2017, at 2:45 p.m. This picture of a bald eagle standing on the north breakwater was taken from the Christmas Tree Ship Point parking lot by Bob Kuhn on December 23, 2016, at 11:29 a.m. This picture of a red-breasted nuthatch feeding on a suet feeder outside our kitchen window was taken by Bob Kuhn on December 4, 2016, at 2:04 p.m. This picture of a female red-bellied woodpecker feeding on a suet feeder outside our kitchen window was taken by Bob Kuhn on December 1, 2016, at 1:08 p.m. This picture of a hairy woodpecker feeding on a suet feeder outside our kitchen window was taken by Bob Kuhn on August 25, 2016, at 8:22 a.m. This picture of a young eagle sitting in a tree across the road from its nest was taken by Bob Kuhn on June 27, 2016, at 10:58 a.m. This picture of a young eagle trying its wings in a tree across the road from its nest was taken by Bob Kuhn on June 27, 2016, at 10:41 a.m. This picture of an American white pelican standing on a rock in Lake Michigan was taken from our yard by Bob Kuhn on June 12, 2016, at 5:18 p.m. This picture of an American white pelican swallowing a fish in Algoma's harbor was taken from Christmas Tree Ship Point by Bob Kuhn on June 9, 2016, at 5:57 p.m. This picture of three young eagles sitting in their nest was taken by Bob Kuhn on May 17, 2016 at 1:46p.m. This picture of a gray catbird feeding on an orange half outside our kitchen window was taken by Bob Kuhn on May 15, 2016, at 7:11 a.m. This picture of a yellow-rumped warbler sitting in a tree outside our kitchen window was taken by Bob Kuhn on May 13, 2016, at 5:48 p.m. This picture of a young bald eagle stretching its wings was taken by Bob Kuhn on May 13, 2016 at 10:49 a.m. This picture of am American goldfinch feeding on one of the bird feeders outside our kitchen window was taken by Bob Kuhn on May 12, 2016, at 7:49 a.m. This picture of a gray-cheeked thrush feeding on the ground in our yard was taken from our kitchen window by Bob Kuhn on May 12, 2016, at 12:25 p.m. This picture of a sharp-shinned hawk in our back yard in Algoma was taken by Bob Kuhn on April 29, 2016 at 6:19 p.m. This picture of three baby eagles in their nest north of Algoma was taken by Bob Kuhn on April 21, 2016 at 11:52 a.m. This picture of a baby eagle looking out of its nest north of Algoma was taken by Bob Kuhn on April 19, 2016 at 2:59 p.m. This picture of a female golden-crowned kinglet sitting in a raspberry bush behind our garage was taken by Bob Kuhn on April 7, 2016 at 7:21 a.m. Kinglets are very small birds, only about 4 inches long. This picture of two tom turkeys strutting in a field on the west side of Algoma was taken by Bob Kuhn on March 30, 2016 at 5:41 p.m. This picture of a sandhill crane feeding in a field along Church Road southwest of Alaska was taken by Bob Kuhn on March 21, 2016 at 3:07 p.m. This picture of two bald eagles on their nest north of Algoma was taken by Bob Kuhn on March 12, 2016 at 9:06 a.m. This picture of a bald eagle sitting on its nest north of Algoma was taken by Bob Kuhn on March 9, 2016 at 11:09 a.m. This picture of a pair of bufflehead ducks swimming on the Ahnnapee River was taken from the Christmas Tree Ship Point parking lot by Bob Kuhn on February 29, 2016 at 11:55 a.m. This picture of a male common goldeneye ducks swimming on the Ahnnapee River was taken from the Christmas Tree Ship Point parking lot by Bob Kuhn on February 17, 2016 at 4:42p.m. This picture of two male common goldeneye ducks swimming on the Ahnnapee River was taken from the Christmas Tree Ship Point parking lot by Bob Kuhn on February 17, 2016 at 2:11p.m. This picture of a Merganser Duck swimming on the Ahnapee River was taken from the Christmas Tree Ship Point parking lot by Bob Kuhn on February 17, 2016 at 4:42p.m. 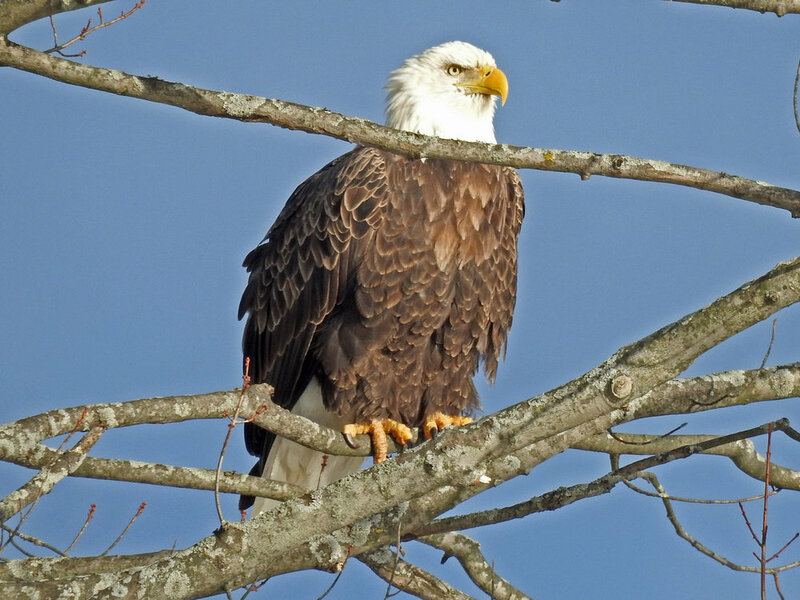 This picture of a bald eagle sitting in a tree between the Community Center and the Marina were taken by Bob Kuhn on February 10, 2016 at 2:28p.m. This picture of a black pheasant feeding along a road southwest of Algoma was taken by Bob Kuhn on December 20, 2015 at 3:00p.m. I think that black pheasants are just a color phase of the common pheasant. 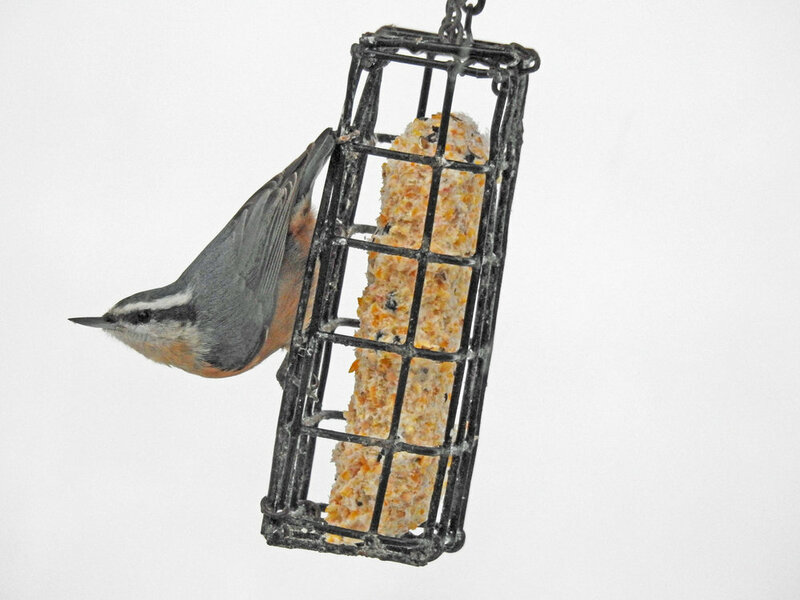 This picture of a white-breasted nuthatch feeding on one of the feeders outside our kitchen window was taken by Bob Kuhn on November 27, 2015 at 9:00a.m. This picture of a white snow goose standing on Crescent Beach was taken by Bob Kuhn on October 16, 2015 at 2:41p.m. This picture of nine snow geese swimming on the lake off of Crescent Beach was taken by Bob Kuhn on October 16, 2015 at 2:29p.m. Snow geese come in a variety of colors and patterns. This picture of a blue jay sitting in a tree outside our kitchen window was taken by Bob Kuhn on June 10, 2015 at 5:37p.m. This picture of three young bald eagles standing in their next North of Algoma was taken by Bob Kuhn on June 7, 2015 at 2:25p.m. This picture of a ruby-throated hummingbird feeding on the hummingbird feeder outside our kitchen window was taken by Bob Kuhn on May 30, 2015 at 12:50p.m. This picture of a dunlin standing on Crescent Beach was taken by Bob Kuhn on May 23, 2015 at 10:29 a.m. This picture of a semipalmated plover feeding on Crescent Beach was taken by Bob Kuhn on May 23, 2015 at 10:21 a.m. This picture of a gray catbird feeding on the ground beneath the bird feeders outside our kitchen window was taken by Bob Kuhn on May 18, 2015 at 7:15a.m. This picture of a white-crowned sparrow resting outside our back door was taken by Bob Kuhn on May 15, 2015 at 11:24 a.m. This picture of a ruby-throated hummingbird feeding on a hummingbird feeder outside our kitchen window was taken by Bob Kuhn on May 14, 2015 at 8:36 a.m. This picture of an Indigo Bunting feeding on a suet feeder outside our kitchen window was taken by Bob Kuhn on May 13, 2015 at 8:14 a.m. This picture of a Ruby-throated Hummingbird feeding on a hummingbird feeder outside our kitchen window was taken by Bob Kuhn on May 12, 2015 at 8:08 a.m. This picture of a Baltimore Oriole feeding on an oriole feeder outside our kitchen window was taken by Bob Kuhn on May 11, 2015 at 5:58 p.m. This picture of a White-throated Sparrow feeding on the ground beneath the bird feeders outside our kitchen window was taken by Bob Kuhn on May 3, 2015 at 7:24 a.m. This picture of two Bonaparte's Gulls on Crescent Beach in Algoma was taken by Bob Kuhn on April 30, 2015 at 5:06pm. This picture of a Brown Thrasher feeding on the ground beneath the bird feeders in our yard was taken by Bob Kuhn on Aril 30, 2015 at 8:32 am. This picture of a Glaucous Gull standing on the South breakwater was taken by Bob Kuhn on April 15, 2015 at 1:42pm. Glaucous Gulls are large white-backed gulls that nest in the arctic. This picture of a Caspian tern standing on Crescent Beach in Algoma was taken by Bob Kuhn on April 15, 2015 at 2:03pm. This picture of a wild turkey along Highway 54 West of Rankin was taken by Bob Kuhn on April 13, 2015 at 12:05pm. This picture of a bald eagle feeding two baby eagles in their nest North of Algoma was taken by Bob Kuhn on April 10, 2015 at 10:39am. This picture of a pair of Sandhill Cranes calling in a field along Highway S North of Algoma was taken by Bob Kuhn on April 1, 2015 at 10:28am. This picture of a pair of Sandhill Cranes standing in a field along Highway S North of Algoma was taken by Bob Kuhn on April 1, 2015 at 10:28am. This picture of a white-winged scoter swimming the the Ahnapee River was taken from the 2nd Street bridge by Bob Kuhn on March 11, 2015 at 3:54 p.m. This picture of a white-winged scoter swimming in the Ahnapee River was taken from the 2nd Street bridge by Bob Kuhn on March 11, 2015 at 3:53 p.m. This picture of a white-winged scoter swimming in Algoma's harbor was taken from Christmas Tree Ship Point by Bob Kuhn on March 11, 2015 at 3:08 p.m. This picture of a bald eagle sitting on its nest North of Algoma was taken by Bob Kuhn on March 11, 2015 at 10:07 a.m. This picture of a male scaup eating something that he brought up from the bottom of the Ahnapee River in Algoma was taken by Bob Kuhn from the Harbor Walk on March 9, 2015 at 2:34 p.m. This picture of a male mallard standing on the ice on the Ahnapee River in Algoma was taken by Bob Kuhn from the Harbor Walk on March 9, 2015 at 2:29 p.m. This picture of a male scaup swimming on the Ahnapee River in Algoma was taken by Bob Kuhn from the Harbor Walk on March 9, 2015 at 2:27 p.m. This picture of a female scaup trying to eat something that it brought up from the bottom of the Ahnapee River in Algoma was taken by Bob Kuhn from the Harbor Walk on March 8, 2015 at 4:50 p.m. This picture of two male scaups swimming on the Ahnapee River in Algoma was taken by Bob Kuhn from the Harbor Walk on March 8, 2015 at 4:44 p.m. This picture of two bald eagles sitting in a tree between the City Marina and the Youth Club in Algoma was taken by Bob Kuhn on March 5, 2015 at 11:56a.m. This picture of two bald eagles sitting in their favorite tree along Lakeview Dr in Algoma was taken by Bob Kuhn on February 26, 2015 at 1:53p.m. This picture of two bald eagles sitting in their favorite tree along Lakview Dr in Algoma was taken by Bob Kuhn on February 26, 2015 at 1:53p.m. This picture of two bald eagles in their favorite tree along Lakeview Dr in Algoma was taken by Bob Kuhn on February 26, 2015 at 1:53p.m. This picture of a bald eagle sitting in its favorite tree along Lakeview Dr in Algoma was taken by Bob Kuhn on February 26, 2015 at 1:52p.m. This picture of a male Redhead Duck swimming on Ahnapee River in Algoma was taken from the Harbor Walk on February 24, 2015 at 4:56p.m. by Bob Kuhn. This picture of a Common Redpoll feeding on the ground beneath the bird feeders in our yard in Algoma was taken by Bob Kuhn from his kitchen window on February 17, 2015 at 12:15p.m. This picture of a Black-capped Chickadee feeding on one of the bird feeders in our yard in Algoma was taken by Bob Kuhn from his kitchen window on February 16, 2015 at 8:01p.m. This picture of a male Northern Cardinal feeding on the ground beneath the bird feeders in our yard in Algoma was taken by Bob Kuhn from his kitchen window on January 31, 2015 at 8:47a.m. Did you see the seed in the bird's mouth?? This picture of a Horned Grebe at Sunrise Cove Marina in Algoma was taken by Bob Kuhn on November 12, 2014 at 11:47am. This picture of a Snow Bunting on the South breakwater in Algoma was taken by Bob Kuhn on October 22, 2014 at 2:12pm. This picture of a Sanderling on Crescent Beach in Algoma was taken by Bob Kuhn from the Visitor's Center balcony on September 29, 2014 at 11:12am. This picture of a group of three American White Pelicans flying over the Ahnapee River in Algoma was taken by Bob Kuhn from the Christmas Tree Ship Point parking lot on July 10, 2014 at 1:29pm. This picture of a flock of American White Pelicans on Crescent Beach in Algoma was taken by Bob Kuhn on July 10, 2014 at 7:50am. This picture of a Bald Eagle's nest North of Algoma was taken by Bob Kuhn on May 21, 2014 at 9:39am. It shows one adult eagle and two young ones. This picture of a group of Hooded Mergansers swimming on the Ahnapee River in Algoma was taken by Bob Kuhn from the Christmas Tree Ship Point parking lot on March 31, 2014 at 5:28pm. This picture of two bald eagles sitting in their favorite tree along Lakeview Drive in Algoma was taken by Bob Kuhn on February 9, 2014 at 3:42pm. This picture of a young snowy owl sitting on a picnic table at Perry Field in Algoma was taken by Bob Kuhn on January 5, 2014 at 2:50pm. This picture of a bald eagle standing on Crescent Beach in Algoma in the rain was taken by Bob Kuhn on November 6, 2013 at 10:13am.